If you were to put 10 bass anglers into a room and show them a purple car, they may all agree that the car is purple; however, you would likely get 10 different answers as to the exact shade of purple the car was. But, if there is any one thing that we can all bass anglers can agree on, it is that we all want to catch more and bigger bass. 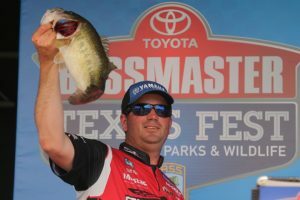 Because they make their livings on the water, professional bass anglers have specific tips and tricks for just about every type of condition known to man. 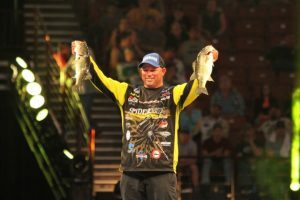 Here’s what Bassmaster Elite Series Randy Howell, Bobby Lane, Cliff Pace and Marty Robinson like to use in the summer to try and put more fish in their boats in their home areas of the country. In the late spring and early summer, fish can be in one of several different phases. There will be bass feeding on the shad spawn, in postspawn recovery, and the late spawners will still be guarding fry. It’s important to be ready for just about any type of fishing this type of year. One of my favorite ways to fish during the early summer months is with topwater. For topwater, I am focusing around the mouths of creeks and pockets on the main body of water. I am searching for bass that are either chasing shad or guarding fry. Even the lethargic, recovering bass will feed in low light conditions looking for an easy meal. I like to make long casts and cover a lot of water and find big bass. I really like two Livingston Lures, the Walking Boss and the Walking Boss part 2. The Walking boss is a single body walking bait that has to be the easiest walking bait you’ll ever fish. When you add in the Electronic Baitfish Sounds with multi-touch, three different sounds plus a silent mode, you really have a bait that can not only catch fish, it can actually call them from a further distance. I use a Daiwa Tatula Elite 7’3″ medium-heavy rod paired with a high speed 7.1:1 Tatula SV TW reel and Samurai braid for these larger topwaters. I like to fish the magnum shaky head on secondary points and drop-offs from shallow to deep water. I throw a Magnum Shaky Head paired with a 10 to 12-inch Yamamoto Curl Tail, or the new 7.5-inch Kut Tail. My setup for this combination is a 7’4″ Heavy Tatula Elite rod and a 7.1:1 gear ratio Tatula SV TW reel spooled with 16-pound Gamma Fluorocarbon line. This is a power technique – big rod, big line and it takes a big hook set. This isn’t the kind of set up where you play them to the boat. Set the hook and horse ’em in. It’s an untraditional power-fishing technique, and you really can fish it fast and cover a lot of water. I typically look for 6 to 12 feet of water for this technique, but as the day wears on I will move deeper to 15 to 18-feet of water. Don’t be surprised if it’s a soft bite. 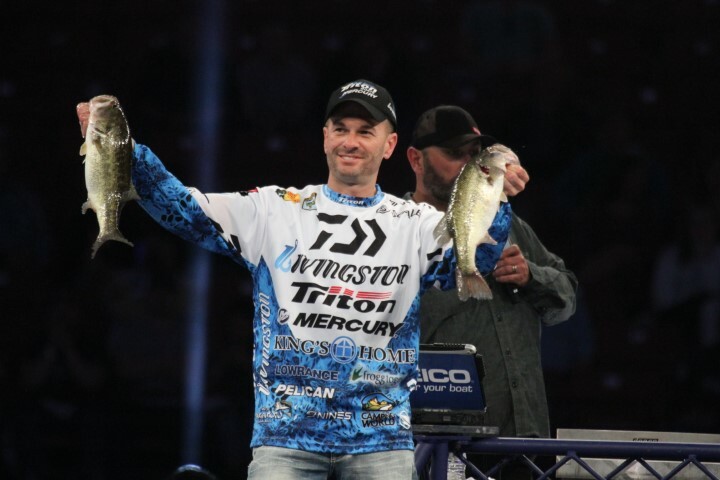 I grew up fishing ultra-shallow waters in Florida, so while I know I can go deep and catch bass off of ledges, there are times that the whole fishing in a crowd thing just becomes too much for me. One of my favorite things to do in the summer – especially later summer – is look for fish that have left the offshore stuff and moved back into the shallows. This usually means a topwater bait. I like a buzzin’ toad, a buzzbait, a frog and a Yo-Zuri Sashimi Pencil. I throw them all on a 7’ medium-heavy Abu Garcia Veracity rod matched with a 7.1:1 retrieve speed Revo Premier spooled with 50-pound-test Spiderwire Ultracast braid. The key this time of the year is to locate something that is a little bit different. I usually look for areas that have cooler water temperature. If I can find water that is two to ten degrees different because of incoming creeks, wind or a large amount of shade on a bank, then I can usually find fish that are willing to strike a topwater bait. I fished an old PAA tournament on Lake Cherokee and found an area that had three creeks coming into the main lake. I caught them on topwater for three days and finished second in the event when nobody said it would be possible. It’s the kind of situation I look for because if you find it; it’s almost like you’re fishing a different lake than everyone else. When they’re all pounding the fish on offshore ledges, you have your pick of the best shallow stuff. The final thought I’d give you is this. Don’t be stupid, if it’s an offshore bite, fish it, but if you can catch enough good ones shallow to be in the running, it’s a great way to fish differently in summer. I actually prefer to fish in the summer over the spring. We always hear about all of the big fish caught in the spring, but the truth is, they are all scattered out and you have to work quickly to find them and catch individual fish by covering a lot of water. I like it when I can find a concentration of fish and make multiple casts to the same spot and catch fish in numbers. When I find that type of situation, I usually have three different types of lures on. I’ll have some sort of deep diving crankbait, a big worm like a Jackall Flickshake 9.8 or V&M Wild thing in 8.5 to 10.5-inch sizes, or my V&M Pacemaker Flatline Football jig. I will rotate through each of these lures; as the fish stop biting on one, I’ll switch to the other. That approach is for big impoundments where fish will group up on offshore spots, but on tidal fisheries or river fisheries where the primary bite is shallow, I like a Jackall Iobee Frog and a V&M Baits Classic Cyclone Buzzbait. Bass can be really aggressive this time of the year and when you put something over their heads in shallow water, at times they just can’t stand it. I’ll always have a follow-up bait ready, which is usually my V&M Pacemaker Adrenaline Flippin’ Jig so that I can give them a different look or follow up on missed strikes. It can be hot out there in the summer, but I really like that you can find fish in one area. It may take a while to find that school, but once you get a bite, you are bound to catch them again and again. I come from an area of the country – The Carolinas – where the fish act different than most. The blue back herring in our lakes create the situation where topwater baits can produce all day long in the summertime. I always have a Lucky Craft Sammy 115 tied on a 7’ medium-heavy Castaway Invicta rod with a 7.5:1 Lew’s Team Lite reel spooled with 15-pound-test PLine CXX copolymer line. I’ll have a second setup like that ready with 12-pound-test PLine 100% Fluorocarbon and a Zoom Super Fluke tied on as well. What I do is start a rotation around the lake hitting as many points, humps, bars and rockpiles as I can. What I will do is make six casts to each one and move on if I don’t get a blowup. When it all comes together, and the bluebacks come into play, I can skitter, skip and walk the Sammy or speed twitch the Super Fluke in that school until they shut down. After they do shut down, I can sometimes move on top of them with my trolling motor and vertically drop a dropshot rig on them and catch a few more, but the surface lures are my main tools. The fish on our lakes will suspend near those offshore features of structure, and the moment that the herring move in, the bass will rush towards them, trying to pin them against the side of the structure and ultimately the surface. While the actual schooling activity can be sporadic, if you have winds that vary from stiff breeze to 10 to 15 miles an hour, the bite can go on all day long; it’s really one of my favorite ways to fish, and my favorite time of the year to fish at home. For many of these products and more – check out Monster Fishing Tackle.